How To Die: Simon’s Choice was filmed over the last few months of Simon Binner’s life, following his diagnosis of motor neurone disease, all set against the backdrop of last year’s parliamentary debates on assisted suicide. Let’s not pretend we can really imagine how difficult his decision was. With a wife vehemently opposed to the slippery legal slope toward euthanasia, Simon Binner’s autonomous assertion of when and how he would die in order to end his unbearable suffering must have torn his family apart. This wasn’t Eastenders, with its hyped ‘issues’, cardboard drama and plastic cast. 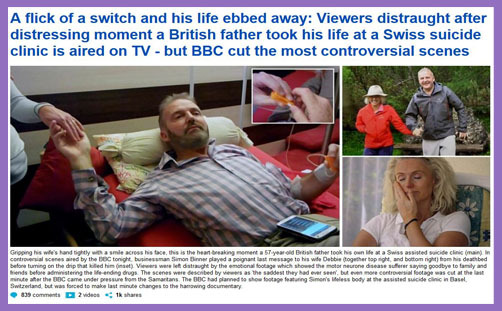 No, millions of BBC viewers watched a real person flick an effectual switch and really die. He closed his eyes right there in front of ours, while his distraught but brave wife held his hand and watched him slip away. It was a real-life, self-made deathbed, and it all seemed so orderly, ethical and legit – at least the broadcasting made it so, which was, of course, the BBC’s purpose. This wasn’t human action morally scrutinised, but political policy advanced emotively. How to Die wasn’t so much concerned with how to die as why on earth not? “The saddest programme I’ve ever seen… but it was right for him,” affirmed the twitterati. Thank God for the Eternal Spirit Suicide Clinic. So the utterly heart-breaking How to Die was a sensitive exploration of a contentious issue with intimate access to how people confront a terrible choice. How many phone calls did the Samaritans receive afterwards? Will bookings to Dignitas or the Eternal Spirit Clinic now increase? Will flights to Switzerland received a bit of a boost? If this sort of “dignified”, “thought-provoking”, “remarkable” TV documentary is justified (and it may well be), when will the BBC sensitively follow a pregnant woman through her BPAS or Marie Stopes counselling? When will they explore the views of her distraught partner as he weeps and longs for the chance to become a father? When will they broadcast the contentious performance and harrowing process of carrying out an abortion, and justify it all to the Guardian on the grounds of it being “ambitious”, “compelling”, “groundbreaking” TV journalism of “one of the toughest decisions there is to make”? Or is it that changing the law on abortion is simply not on the BBC’s political agenda?